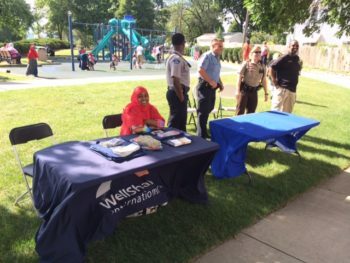 WellShare staff members Eugenia Canaan and Fatima Mohamud participated in Seward’s Neighborhood Night Out at the Seward Plaza East building on July 28th. 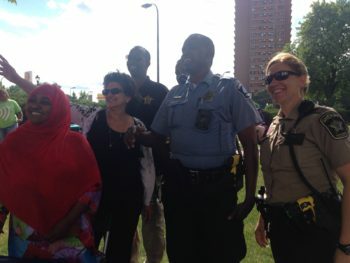 Eugenia and Fatima are both part of WellShare’s Eliminating Health Disparities program, which works to reduce risk factors for diabetes, heart disease, and stroke, specifically in Minnesota’s Somali community. 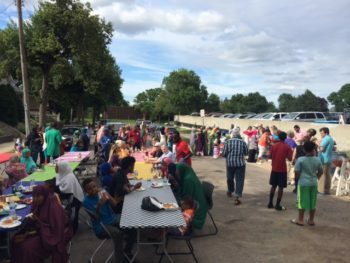 Through this program we expect to see reduction in negative health outcomes such as diabetes diagnoses and unhealthy weight gain, and uptake of positive health outcomes such as increased consumption of healthy food, increased daily physical activity, and an increased sense of well-being and trust in the service of Community Health Workers. 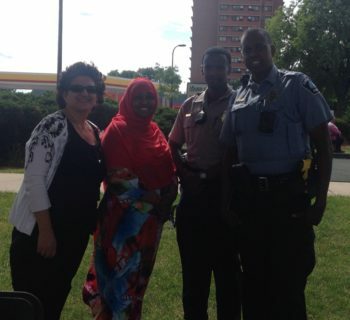 In between talking to Seward neighborhood residents about chronic disease management and prevention, risks of high blood pressure, and the importance of healthy eating and exercise, Eugenia and Fatima posed with police officers who had their table set up next to WellShare’s! Visit EHDI’s program page to learn more about the Eliminating Health Disparities program.